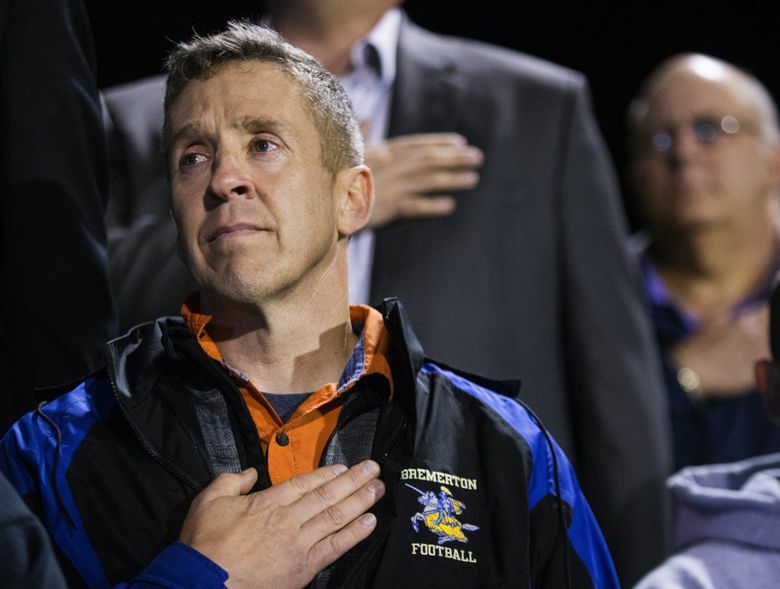 The 9th Circuit Court of Appeals has refused to reinstate former Bremerton High School football coach Joseph Kennedy, who lost his job after he refused to stop praying on the field after games. In two opinions totaling 62 pages, the appeals judges said Kennedy could not prove he was exercising his First Amendment rights as a private citizen when he insisted, against orders by the Bremerton School District, on taking a knee at the 50-yard line after football games and praying. Kennedy sued with the help of the conservative First Liberty Institute from Plano, Texas, claiming the district was infringing on his religious and personal rights. After losing at the district court level, he took the issue to the 9th Circuit Court of Appeals. Jeremy Dys, deputy general counsel at the institute, said he was “deeply disappointed” by the court’s opinion and opined that it would lead to further erosion of religious liberties. “Now, a coach can’t even bow his head,” he said Wednesday. Kennedy and his legal team are “weighing all our options,” including seeking a rehearing, asking for a hearing before an expanded panel of judges, or an appeal to the U.S. Supreme Court, Dys said. “Public schools should be a welcoming place for all students and families,” he said. The appellate panel concluded that Kennedy could not overcome the fact that he was a district employee and was in violation of the district’s policy. In addition, the panel ruled, his behavior could reasonably be seen as the district’s endorsement of his beliefs, in violation of the Establishment Clause of the U.S. Constitution, which prevents the government from endorsing one religion over another. As a coach, Kennedy had access to the field that the general public did not have, and he insisted on praying on the sidelines after the game, in view of parents and students. “When Kennedy knelt and prayed on the fifty-yard line immediately after the games while in view of students and parents, he spoke as a public employee, not as a private citizen, and his speech therefore was constitutionally unprotected,” the judges concluded. The unanimous main opinion was authored by Judge Milan Smith, who also wrote an instructive “specially concurring” in which he concluded that the district had no choice but to stop Kennedy and explained why, in the context of the debate over religious freedom by the nation’s founding fathers. The district “justifiably restricted Kennedy’s speech … An objective BHS student familiar with the relevant history and context would perceive Kennedy’s conduct to reflect school endorsement of religion, encouragement of prayer, and a preference of one particular faith,” he wrote. “On Friday nights, many cities and towns across America temporarily shut down while communities gather to watch high school football games,” Smith wrote for the unanimous court. “Students and families of all walks of life join ‘to root for a common cause’ and admire young people who step proudly onto the field. “While we recognize the important role that public worship plays in many communities, as well as the sincere desire to include public prayer as part of these occasions, such activity can promote disunity along religious lines, and risks alienating valued community members from an environment that must be open and welcoming to all,” he wrote. Kennedy also has sued the school district, claiming the district discriminated against him on the basis of his religion and violated both his First Amendment rights to freedom of speech and religion and the Civil Rights Act of 1964. He has also drawn support from President Donald Trump and Ben Carson, secretary of Housing and Urban Development.